There is a perfect yin-yang balance to the music of Emily Saliers and Amy Ray, known as (the) Indigo Girls since their college days in the mid-’80s. They’d already been singing together for years at that point, childhood friends from outside Decatur, Georgia. In 1985 Saliers and Ray put out their own EP and first album, found a manager (Russell Carter, who still holds the post), and signed with Epic records within three years. Enough women were finding success in the folk-rock sphere that radio (or rather, the consultants that dictated programming) was growing less leery of female voices, and together they found a home in a community of thoughtful and talented peers. The duo write their songs separately, and you don’t need to read the liner notes to know which is which. Sophisticated, soaring melodies and intricate guitar and banjo work? That’s an “Emily song” (See: “Power of Two,” “Watershed”). Does it lean to the rockier side, with gutsy fervor and a rousing crescendo? That’s an “Amy song” (See: “Land of Canaan,” “Three Hits”). But the beauty of their teamwork is in how the sum of those two parts bloom. Ray and Saliers, both accomplished composers and players, build arrangements together that use their individual talents to temper and augment their natural leanings, creating a shared catalog of songs that have connected with millions. Indigo Girls lyrics tell our stories: They plumb the depths of relationships, chart the struggles it takes to live our best lives, and speak with passion about the greater world and our responsibility to advocate for social and legal justice. Both lesbians, the duo, who were never a romantic couple, are longtime activists for gay rights, the environment, the rights of Native Americans, and against the death penalty. With Winona LaDuke they founded Honor the Earth, in support of Indigenous environmental justice. Both have roots in the church — Saliers' father is a retired theology professor and Ray was a religion major in college — so a spiritual streak runs through Indigo Girls' songs. It surfaces in a practical way, about how we act in the world, like in Saliers' "Hammer and a Nail": "A distant nation my community/A street person my responsibility/If I have a care in the world I have a gift to bring." You can hear those details in “Didn't Know A Damn Thing,” from Ray’s 2018 solo album Holler, about a white kid growing up in the Jim Crow South. From the late Eighties through the Nineties, seven Indigo Girls albums sold in gold or platinum numbers, including a live collection. The impeccable Nomads Indians Saints (1990), Rites of Passage (1992), and Swamp Ophelia (1994) form a core of work that cemented the duo in the musical canon, and "Galileo" became the duo's first modern rock top 10 track. They’ve gotten mainstream recognition, including a Grammy album win in 1990. (In a crazy twist, they lost Best New Artist to Milli Vanilli: talk about a lack of justice!). Most importantly to them and their fans, the Indigo Girls have built a solid community that sustains them, and each other, to this day. On the music community front, their early touring bands included Gail Ann Dorsey, Sara Lee and Jane Scarpantoni, all of whom enjoy flourishing careers and mad respect; and as “folkies” not afraid to tear it up on stage, they’ve brought Brady Blade and Matt Chamberlain out on drums. They’ve actively supported the growth of younger artists, and Ray built her own label, Daemon Records, to release their work. And they don’t have to be in the room to inspire and infuse the culture; on Pride.com’s list of “100 Lesbian Things To Do Before You Die,” number 29 says, “If you've never sung ‘Closer to Fine’ at the top of your lungs on a road trip, you're missing out on a near-universal lesbian experience.” Since back before gay women were a visible part of American culture, Indigo Girls shows have been important annual ritual gatherings; if you didn’t run into your ex-girlfriend in the lobby, you at least ran into your exes’ ex. The ‘Girls closed out the ‘90s with strong albums, Shaming of the Sun and Come on Now Social, a spot on the Lilith Fair tour, and their biggest radio hit with "Shame on You." Since then they’ve both released solo albums and added a Christmas record, plus their 13th and 14th studio albums, Beauty Queen Sister and One Lost Day. The most recent chapter in the pair's history has been touring with a stage full of collaborators. There are new arrangements of 22 of their songs, like "Closer to Fine," on the 2018 release, Indigo Girls Live with The University of Colorado Symphony Orchestra. The duo tours regularly, mostly without orchestral support, but always in the company of friends, like Lucy Wainwright Roche (who sent us her Five Essential Indigo Girls songs), on and off the stage. They have a frequent collaborator and fan in Brandi Carlile; they played her Girls Just Wanna Weekend Festival in early 2019. Brandi thanked them via Instagram, saying, "There can be NO doubt that none of us would be in the position we are in without the soulful path that the Indigo Girls have paved for us. One thing that kept feeling clearer and clearer to me throughout the festival is how many of us (fans and artists) have been brought together by the two of them... either through opening for the Indigo Girls or just their constant selfless collaborations and activism. They have instilled the spirit of togetherness and collaboration in me more than any of my other influences." As a band that made history, and continues to; as sharp and caring cultural commentators; as a living example of how our differences make us better and stronger when we work together -- we joyfully salute the Indigo Girls as FUV Essentials. 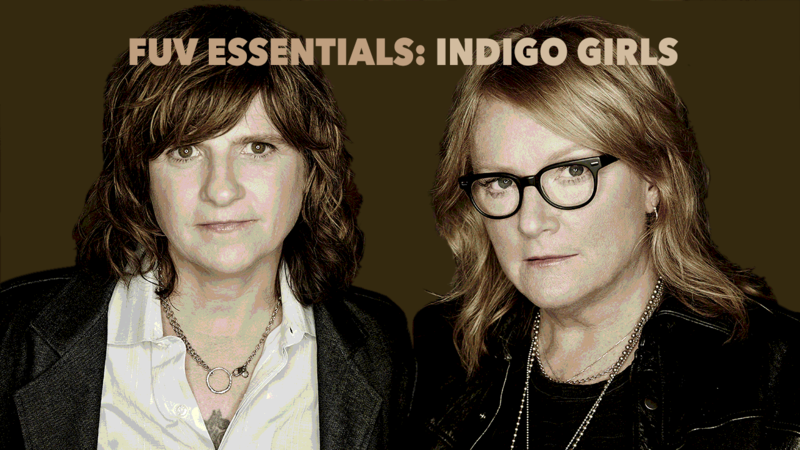 WFUV's history with the Indigo Girls, including interviews and live shows, can be found here.